Guilherme Ferreira de Avila ’16 delivered farewell remarks for the Class of 2016 during the 181st Commencement May 21, and in Lafayette tradition, presented the sword of the Marquis de Lafayette to his classmates. He is the recipient of the George Wharton Pepper Prize, awarded to the senior who “most closely represents the Lafayette ideal.” Ferreira de Avila, of Araxa, Brazil, graduated with a bachelor of arts degree in economics. Read and listen to his speech below. Good afternoon class of 2016, our families, friends, members of the Lafayette community and distinguished guests. Today I would like to speak about something that is very familiar to all of us. 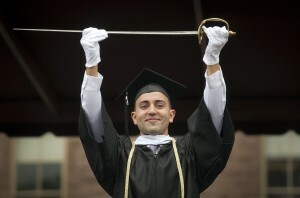 Guilherme Ferreira de Avila ’16 holds the sword of the Marquis de Lafayette. It comes in many forms and it expresses itself in many ways, but we more often than not tend to bypass it or look the other way. Today I would like to speak about privilege. And we all have it – in one way or another. To a friend, privilege is graduating from college, to another one, it is being a white male from New York City. A third friend thinks privilege is the idea being comfortable. Now, I would disagree with this last notion. Comfort to me is very similar to complacency and an acceptance that circumstances shape us, and not the other way around. Do not get me wrong, I see limitations and constraints on various levels, but, personally, I think the most insulting thing someone might say about me is that I seem average. I don’t want to be comfortable. I do not think mindless repetition adds to anything. It is like overlapping nuisance. And being a nuisance is my biggest fear. Privilege is often the ability to not look, to go with the flow, to not have to work to pay bills, to not have to study every minute you are awake to understand the material, to not have to work hard to have friends. This is all privilege. And we are too used to many forms of it. But what I consider the greatest privilege of all is something else. We all have it, one way or another. Especially having access to a world-class education here at Lafayette. It is the privilege of taking risk. About five years ago, I was unfulfilled about the path my life was taking. I was studying international relations at the most prestigious academy in Latin America, one that prepares you for the diplomacy academy. While this would have provided me with a robust set of qualifications, I soon realized that career wasn’t for me. Sure, I could have finished the degree, gotten the diploma and with that sheepskin, gotten a job in the private sector, which is what I thought I wanted. But I knew that, for me, there was the chance of something else out there, something better. So I took a big risk and put a hold on my then current degree. I started calling colleges and universities all over the U.S. I wanted to embark upon a liberal arts education to better understand my drives and passions. Soon, I realized that what I wanted was very much the opposite of my prior school: I wanted a small, liberal, one-on-one kind of school. And so I found Lafayette. I still remember calling admissions one late afternoon. We chatted about the fact that I wanted to come as a first year, about my grades, and the fact that I needed financial support to be able to afford to come here. The hold on my former degree was to expire about a month before admission letters from Lafayette would be sent out. I wouldn’t have a fallback, so I needed to be all-in. These were months I would wake up at 5 a.m. and go to bed at 11 p.m., spending the entire day perfecting my ACT scores, TOEFL, scores and my SAT scores, anything I could do to have a better chance. After about one year after leaving school, filled with long study days, excessive anxiety and daydreams, I got in. And the rest is history. The fact of the matter is that this is a story of privilege: I was privileged to have had parents who supported my decision to start over. Not many get that privilege. I was privileged because I was able to read websites in English and call colleges to understand the process. I was privileged that my mind was not holding me back. At Lafayette, I was privileged that I could be openly gay, every day. I was privileged by having phenomenal mentors. I have brilliant and much more talented people surrounding me here. Some of my friends at Lafayette have thrived in extremely tough circumstances, from depression, the unexpected inability to pay for next semester’s tuition, to panic attacks, and deaths. This is not privilege. Life happens when no one else is looking. Still, my friends and classmates excelled at using their life experiences to fuel their dreams. On the other hand, privilege is demanding; it comes with its own set of impediments and demands. And with privilege comes responsibility. While it may be liberating, providing us with opportunities and oh-so-much leeway in life, privilege may also be crippling, filling our entire bodies with anxiety about a late night paper that has the capacity to turn all dreams into dust. To maintain the standards that others have for us is at times paralyzing. In trying to withhold and excel at the standards I personally have set for myself, I have failed and felt unaccomplished multiple times, but somehow seemed to have done okay. The beauty of privilege is that it may be forged by work, resilience and determination. You may not fit your own preconceived notion of the good side of a circumstance, the privileged side of it is, but you learn to leverage what is unique about you to amass to something greater for all. That is a privilege. You commit your entire being to what you are passionate about. You create change. We have the choice to create change. We have the privilege to take risk. You can do something for yourself. You can something for others. So many paths and adventures are out there for us in a world of known unknowns. And it is all blurry but still filled with exciting and truly transformational experiences. We have the privilege to take risks for us and for others, to impact the world in a positive and unique way. Today and in years to come. How much are you willing and able to risk? Now that is your call. But I truly, sincerely, hope that you will use your privilege to take risks.